Castle Hill, or Hradcany, is one of the most-visited parts of Prague, next to the Old Town. The complex on Castle Hill is a jumble of palaces, churches, gardens, and galleries that describe the history that has evolved here over the centuries. Many of the buildings are open to the public year round - others are open only on special occasions or to administrative personnel. Ascend the stairs to the so-called Prague Castle, which is really a complex of palaces and chapels, not a solitary structure that was once the residence of kings. The Old Royal Palace, the Archbishop's Palace, St. George's Basilica, and St. Vitus Cathedral are contained within the Prague Castle walls. 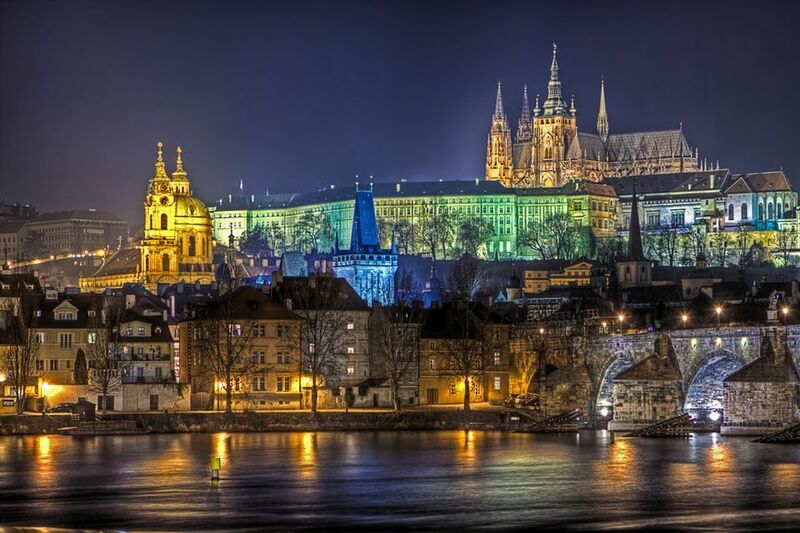 The interior of Prague Castle is, like the exterior, a conglomeration of architectural styles. Romanesque, Gothic, and Baroque elements remain, showcasing the long use of this site, with careful restoration having taken place to maintain the integrity of the structures. While the chapel in Old Saints Church at the Old Royal Palace is not open to the public during the week, it is open for services on Saturdays at 4 pm. In addition, it sometimes plays host to concerts at various times during the year. After a fire in which most of its Romanesque details were destroyed in 1541, the church was rebuilt to extend, by way of Vladislav Hall, to the Old Royal Palace. St. Vitus Cathedral is Prague's most important church, to which its exquisite Gothic architecture attests. Two other churches have stood on this site, and construction on the most recent structure began in the middle of the 14th century. St. Vitus Cathedral took several centuries to complete. The first architect, Matthias of Arras, planned the cathedral and began construction. He died in 1352, and a young architect by the name of Peter Parler took over; Parler worked according to the original design, but was left to his own devices once the original plans were implemented. Parler was eventually succeeded by his two sons, Wenzel and Johannes. However, after many stops and starts on construction, it would not be until the 20th century that the cathedral was finally completed. While the interior of St. Vitus Cathedral is strikingly beautiful, the stained glass windows are of special note. Alfons Mucha, the Czech Art Nouveau painter, was responsible for new stained glass windows for the north wall of the cathedral, which were installed during the 20th century. Visitors to Castle Hill love to watch the changing of the guard - which happens every hour, on the hour. At 12 noon, it's possible to watch a special flag ceremony during the changing of the guards. The Royal and South Gardens at Prague Castle are open daily April through October. You can stroll through them without having to pay a fee. The gardens are a great place to view Prague from above. So don't forget your camera! You can visit this magnificent library of Strahov Monastery on a guided tour. Included in ​the collection are rare books, illuminated manuscripts, and theological texts hundreds of years old.